At Etsy, COO Linda Kozlowski spearheaded international expansion, unified and started growing its marketing plans, began redefining the company’s brand, launched a new communications strategy, and kicked off the integration of user feedback into product development — all in about six months. While others might just credit her capabilities, she’s quick to cite the plan that CEO Chad Dickerson laid out. He outlined not only how her specific acts would make a difference for Etsy’s customers, but also how her role would link to the rest of the leadership team — especially Dickerson. That exactitude bred effectiveness. Kozlowski is part of a new crop of COOs who are harnessing know-how from a range of roles to create systems that elevate the entire company. At places like Evernote and Alibaba, she’s held leadership roles in global expansion, marketing, public relations, customer experience and business development. Decades of broad exposure has not only shown her which levers make each functional area work, but also how they can be coordinated for a startup to succeed. At First Round’s CEO Summit, Kozlowski puts a spotlight on the most mysterious role in the C-suite. She outlines why and how companies should make operations their core and how to determine the COO that’s right for you. 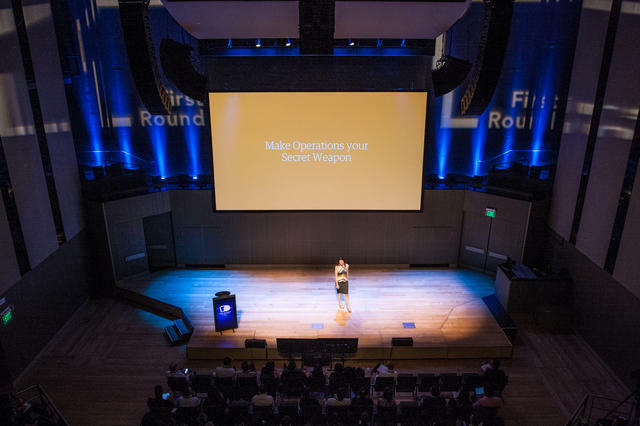 Kozlowski shares what an operations leader is — and is not — in order to set the position up for success at any startup. It’s common for startups to wait too long before bringing on an operational leader due to the lack of clarity around the role. It’s more intuitive what other C-suite roles do: a CMO leads marketing and a CTO oversees engineering. But it’s less apparent with a COO. Even a quick Google search for definitions leaves much to be desired: “a senior executive responsible for managing the day-to-day operations of a company.” But don’t functions have their own ops team, such as sales and sales ops? The COO role is entirely defined by its relationship to the CEO. Determining the right candidate requires deep introspection and what Kozlowski calls Self-Awareness 301: an advanced course in pinpointing your strengths and weaknesses and thinking very seriously about how those attributes influence the way you manage your business. Ask yourself these questions to unveil the traits you need in a COO. What am I drawn to? You enjoy, default, and excel at these tasks. Write them down. Seriously. Return to them and note how they structure your day and management style. What do I procrastinate on? We all have those lingering items in our inbox or to-do list that we push off or tell ourselves ‘I’ll do that tomorrow’ but never do. It may be you don’t have enough time, but there’s likely a skills gap you need to admit. Create a list when they occur to you and make sure they are traits and abilities in your COO. What do I wish I knew and liked? Of the things you delay or just skim the surface on, what do you wish you had a better command of or affinity for? You’ll eventually be adept at and attracted to these areas, but in the short term, you need to find ways to develop them. Your COO should act as an instructor to guide you. Answer these aforementioned three questions on your own first. It’s unlikely that there’s another co-founder or colleague has been working with you every step of the way throughout your career. So you’re the best judge of what you love to do and where you need to improve. Once you have answers to these questions, Kozlowski recommends enlisting others as a sounding board. These might include your executive team, board and investors, mentors, partner or executive coach. “Don’t guide their thinking or come with too many prefaces. Whether expressed verbally or in writing, encourage them to weigh-in on who you are, the roles you excel in and the areas where you need to grow,” says Kozlowski. Think of it like a puzzle where your COO will fill in the missing pieces to round out your leadership team. Customize and choose your counterbalance. Now that you know what you need, you can start to seek the COO who is most capable in helping you scale your company. According to a Harvard Business Review article, there are seven types of operational leaders. 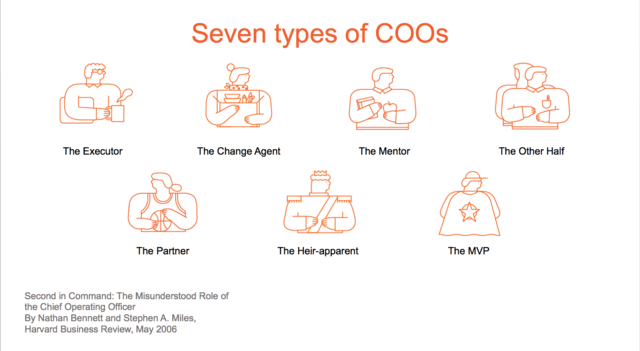 Given that the COO must be a complement to the CEO and founder, you’ll likely need a combination of the roles to distinguish the right partner for you. The right COO is not about pedigree but precise fit. With a COO, you want a person who is poised to lead her position, not leap in position. The CEO. This goes back to the ego check. Your COO must accept and internalize that their job is to run the plays, not call them. A babysitter. A COO is not a nanny or handler for a CEO. Sadly, this is a disturbing trend and one that is destined to fail the duo — and the company. Do not hire a babysitter. Someone who needs a ‘C-title’ to join. If you need to add Chief to a candidate’s title to persuade them to join, don’t add them at all. What kind of help do I need? Why do I need it? How will it address an obstacle? How strongly is this obstacle influencing the company? What exactly will this person do to alleviate the impact from this obstacle? How will that change over the next quarter and year? A COO helps you cover double the ground, as well as double-down. She should be seen as a multiplier. Pass the baton with an Olympian's precision. As CEO and founder, you’ve likely built deep relationships with your direct reports. Explaining that they will report to a new executive is among the trickiest — and most telling —parts of the integration of a COO. The transition won’t happen overnight and team members will still come to you if and when they don’t get their way. CEOs must explain why an operations focus is necessary for the company and direct them to the COO. This was especially important during Kozlowski’s integration into Etsy. Chad introduced Kozlowski to the company via the all hands meeting before she even started, getting everyone excited about the additive skillset to the leadership team. He was clear about her areas of responsibility right from the start, which meant that her first day, everyone was prepared to jump in and work with her. Ultimately, all of the effort you placed into sourcing and closing the right partner can be lost at this point. Actively manage the process with empathy and resist the urge to micromanage. Before a COO can be a possibility for a CEO and startup, it must first be on the radar. Start with a short self-assessment of your strengths and weaknesses as a CEO or founder. Complement that with perspectives from your existing executive team and advisors. Define your counterbalance and use the seven types of COOs as a tool. When interviewing look for the five traits needed for any type of COO and beware the three most common red flags. Hire a COO immediately if you are building a physical product, and after product/market fit, if you are working with a digital offering. Be as conscientious in integrating the COO as you were in hiring her. Your approach will either propel or dispel her reason for being there.